Nogales City Hall is located at 777 North Grand Avenue, Nogales, AZ 85621; phone: 520-187-6571. Photo: George Dunbar House, ca. 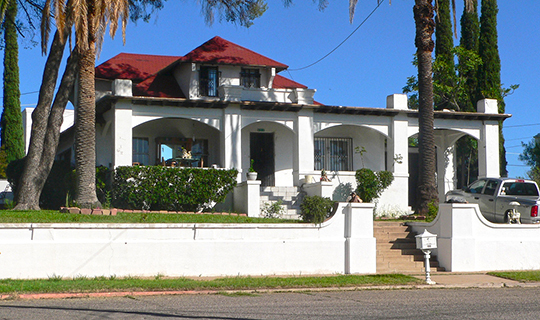 1918, 605 Sierra Avenue, Nogales, AZ. Listed on the National Register of Historic Places in 1985. Photographed by User:Ammodramus (own work), 2013, [cc-by-1.0 (creativecommons.org/publicdomain/zero/1.0/deed.en)], via Wikimedia Commons, accessed January, 2014. Nogales means "Black Walnuts" in Spanish. As a major north/south exploration route, the Nogales Pass, leading down into the Santa Cruz River Valley, is documented as having been used by Spanish explorers as early as 1539. By 1690, the route was an established corridor used by Spanish missionaries, most prominently Father Francisco Kino, who had founded the Mission of San Gabriel de Guevavi near present-day Nogales in 1692. When the region was a part of Mexico, Don Jose Elias and his parents petitioned the treasurer of Sonora for a land grant of 7-1/2 square leagues (22-1/2 square miles) in the area of Nogales Pass. The grant was given on January 7, 1843, and the ranch subsequently developed was called "Los Nogales de Elias" after the walnut grove existing in the flat at Nogales Pass, The earliest map of the area in 1859 shows the existence of a ranch as "Rancho Nogales." The road north from the west coast Mexican seaport of Guaymas to Tucson has also been established as a major trade route by this time, again passing through Los Nogales and into the Santa Cruz River Valley. The Gadsden Purchase, ratified by the United States and Mexico on June 30, 1854, put the area of Los Nogales within the newly created territory of New Mexico. The purchase was initially conceived to give the United States a seaport at the Gulf of California but, more importantly, was intended by the United States, despite opposition from Mexico, to insure the possession of the territory required for a southern transcontinental railroad route. The International Boundary Commission, headed by Major William H. Emory, located marker 26 in Los Nogales Pass in 1855. The area of Los Nogales along the international border remained simply a point along this north/south trade and stage route until 1880. With the Gadsden Purchase, the area was also opened up to exploration and settlement initially by prospectors and miners who discovered or rediscovered rich silver mines in the Patagonia and Pajarito Mountains on either side of the Santa Cruz Valley near the border. Such mines as the San Antonio Mine (1862), the Patagonia Mine (1858) , the Oro Blanco Mine (1873) and the Harshaw Mine (1873) drew many people to the area and increased travel and trade through Los Nogales Pass. In 1880, Juan Jose Vasquez opened a road house near boundary marker 26 on the Sonoran side of the line. This is the first building located at Los Nogales and represents the beginning of permanent settlement in the location of the present-day twin cities. In August, 1880, the Mexican government created a customs office to be located at Los Nogales. Sources indicate that the establishment of the customs office was in anticipation of the location of the northern terminus of the Sonoran Railroad at Los Nogales then being constructed north from Guaymas. This is perhaps premature since the route at that time was planned to intersect the border farther east at Juarez. The decision was more probably the result of increased trade along the Santa Cruz Valley route. The construction of the New Mexico and Arizona Railroad by the Atchison, Topeka and Santa Fe Railway, and eventual connection with its affiliate, the Sonora Railway Company, Ltd., at Nogales is significant as the first outlet of the AT&SF Railroad on the Pacific Coast. It is also important as the first transnational railroad to the west coast of Mexico, opening up increased trade between the two countries. The construction of both the north and south railroads was completed in October, 1882, and on October 25th, the lines were formally opened with a brief silver spike ceremony attended by a train load of Tucson citizens as well as their Mexican counterparts from Guaymas and Magdalena. The spike was driven by Mrs. Morley, wife of the SPRR Chief Location Engineer, and C.C. Wheeler, general manager of the Santa Fe Railroad. The event is significant to the history of Nogales because it signaled the permanence of the settlement established by Isaacson, and, with the eventual location of substantial improvements by the Santa Fe within their 19-acre reservation at the border, forecast Nogales' future role as a regional center of commerce and transportation. In 1883, Jacob Isaacson left "Isaacson," which had simultaneously been called Line City, Villa Riva (Mexican side), and Nogales. On June 4, 1883, the post office name was officially changed to Nogales. During the first ten years of the history of Nogales, its growth was steady, typical of a railroad boom town with the added incentive of prosperous regional mining. It reached a population in 1893 of 1,700, almost double its 1883 estimation of 900.